As promised, here are some cupcakes that I made today. They were a hit. I made enough for all the children in my school children's classes (45) and 4 extra. My 4 children wanted to eat them all! 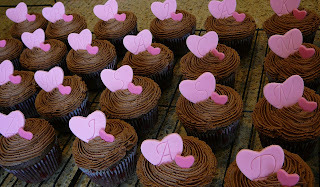 Once they were cooled, I covered them in chocolate butter cream icing and added fondant hearts. Each cupcake has a monogrammed fondant heart with a child's initial. I used my Wilton press set of letters again. These were a lot of fun! I hope the children enjoy them tomorrow! Happy Valentine's Day (a little early)!